E.T. 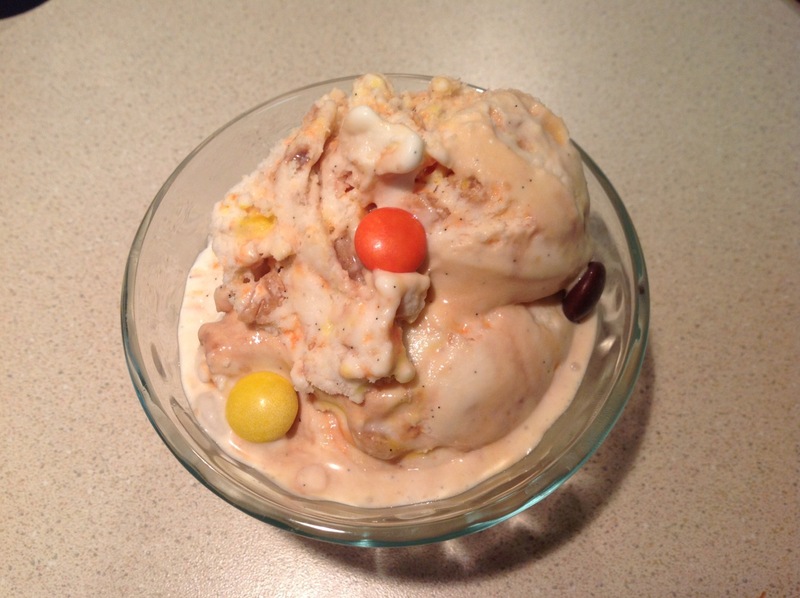 - The Extra-Terrestrial is an incredibly good movie, and I'm celebrating its 30th anniversary with this Reese's Pieces Ice Cream, a nod to the peanut butter candy Elliott uses to coax E.T. out of the shed and into the house. I've read the production originally sought to use M&Ms, but the candy company wouldn't allow it. So they turned to the similarly shaped Reese's Pieces which, in 1982, had only been on the market a few years. Since the movie went on to become a massive critical and commercial hit--it was a Best Picture nominee and the highest-grossing movie of all time in the U.S. for 15 years--this was surely a major boon to Hershey, maker of Reese's Pieces. Unlike the pieces' better known cousin, Reese's Peanut Butter Cups, there is no chocolate in Reese's Pieces. They are just a sweet peanut butter filling coated with a hard candy shell that's either orange, brown or yellow. This ice cream is really quite simple: I used Jeni Britton Bauer's basic recipe for vanilla bean ice cream and stirred in some Reese's Pieces I'd pulsed in the food processor a few times to break them up a bit. If you don't want to make ice cream, you could achieve a similar result by letting store-bought vanilla ice cream soften a bit and then stirring in the crushed candy. 1. Mix two tablespoons of the milk together with the cornstarch in a small bowl. Whisk together cream cheese with salt in a large bowl. Fill a large bowl with ice water. 2. Split the vanilla bean pod in half the long way and scrape the seeds into a medium heavy saucepan. Add bean pod to pan along with remaining milk, cream, sugar and corn syrup. Bring mixture to boil and boil for 4 minutes, stirring to prevent it from boiling over. Remove from heat. Slowly whisk in the milk/cornstarch mixture. Return to heat and boil for 1 minute until mixture starts to thicken. Remove from heat and whisk into the cream cheese until combined and smooth. Pour mixture into 1-gallon Ziplock bag and submerge bag in the ice water bath, adding additional ice if necessary. Chill for 30 minutes. The mixture can now be refrigerated if needed. 3. Spin ice cream in ice cream maker according to manufacturer's directions. 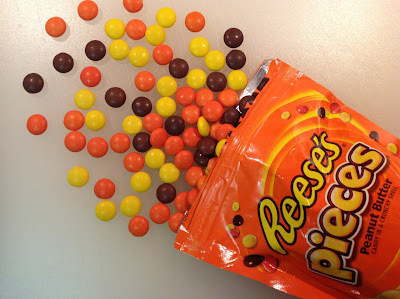 While spinning, pulse Reese's Pieces a few times in a food processor to break up. When ice cream is done, stir candy into ice cream until combined. Freeze completely in freezer. This was really good and another example of how Jeni Britton has changed my life. She's great isn't she? I'd like to try her actual product sometime. I'll keep checking the freezer case to see if turns up at any of our grocery stores.